1. Preheat the oven to 150°C, gas mark 2. For the marinade, combine all ingredients except the ribs in a large bowl and whisk until the sugar has dissolved. 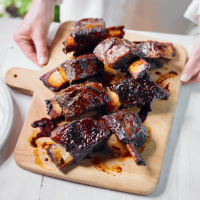 Arrange the ribs bone-side up in a single layer in a roasting tray or ovenproof dish. Pour over the marinade then cover tightly with foil. 2. Transfer to the oven and cook for 4 hours until tender. Remove the ribs from the liquid and set aside to cool completely. Pour the marinade into a large jug and leave for 10 minutes to settle – the fat will rise to the top during this time. Skim the fat from the top of the liquid and discard. Pour the marinade into a saucepan, bring to the boil then reduce by half until dark and sticky. 3. Preheat the barbecue or grill. Add the ribs and heat through for 10 minutes, turning regularly. Towards the end of cooking, brush the meat regularly with the reduced sauce, keep the ribs moving at this point to prevent the sauce from burning. Remove the ribs from the heat and give them a final brush with the sauce. Serve with the remaining sauce.